Casio wanted to test out just how rugged their G-Shock GPW-2000 GRAVITYMASTER watch was, so they decided it would be a good idea to send the device into space. The G-Shock GPW-2000 GRAVITYMASTER was sent into space on a weather balloon, have a look at the video below. The Casio G-Shock GPW-2000 spent one hour and 22 minutes in space at temperatures of minus 58 degrees Celsius. It was sent to a height of 44.1 km before it came back to earth. After surviving the space time continuum, the still functioning G-SHOCK – designed to accurately keep time anywhere in the world – hurtled back to Terra Firma to complete a galactic round trip of 82.55 kilometres, taking two hours and forty-six minutes. 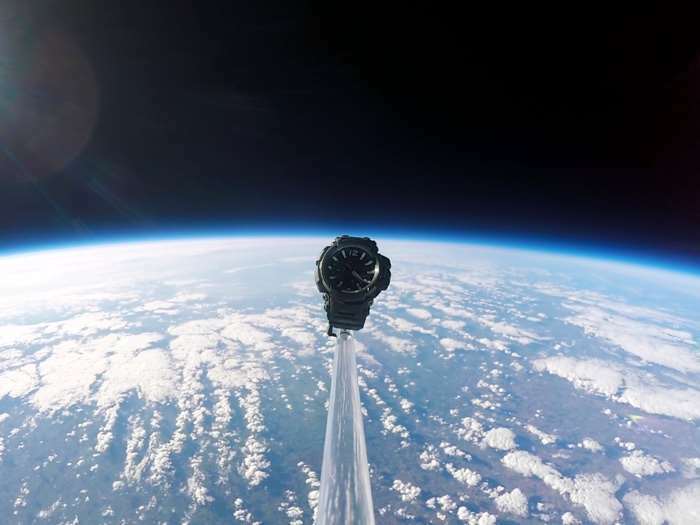 As a final test of the watch’s tough credentials, the last leg of its mission was a 65 kilometre per hour free-fall to earth for 123 metres – 14 metres higher than St Paul’s Cathedral in London – over 12 times the standard 10 metre drop every G-SHOCK is tested to withstand. You can find out more details about the Casio G-Shock GPW-2000 GRAVITYMASTER over at Casio at the link below.